Serifos, between Kythnos and Sifnos, was the home of Perseus and his mother Danae. All the numismatic types of the island are inspired by the legend of this hero. The ancient city has not been located and nothing is known of the history of the island. In the Persian Wars it took the side of the other Greeks and fought in the battle of Salamis. It was also a member of the Delian Confederacy. 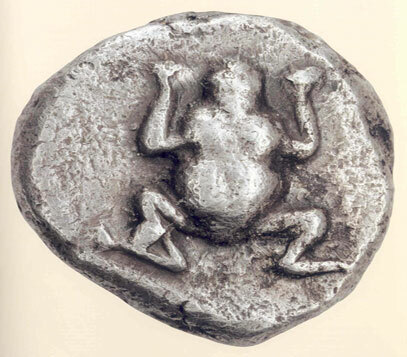 The choice of the frog, depicted realistically on the Archaic staters of Serifos (ca 530 BC) was based on the pun "Seriphian frog", an expression applied in ancient times to those who refused to speak. Ancient Serifos was renowned for its frogs, which were associated with the local - and according to Pausanias, "great" - cult of Perseus. The other issues of Serifos are in bronze and depict the head of the hero wearing a winged helmet on the obverse and a harpy or head of Medusa on the reverse.